Tamiya 1/35 Zimmerit Coating Sheet Elefant Discounts Apply ! 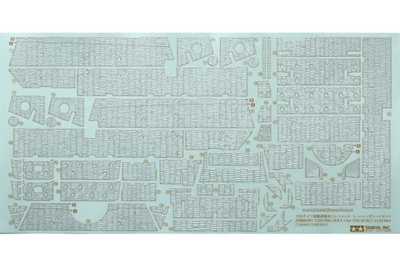 TAM12644 - Tamiya 1/35 Zimmerit Coating Sheet Elefant. Simulating Zimmerit on military models using putty enhances the model's presence but at the same time it requires advanced skills and is time consuming. The Tamiya sticker sheet enables easy reproduction of Zimmerit on the separately available 1/35 scale German Heavy Tank Destroyer Elefant. By simply applying the stickers on the Model and then painting, a realistic Zimmerit effect can be achieved. Two different coating patterns are included to match the kit-included marking options. Specifications: Zimmerit Sticker Sheet x1, Compatible with 1/35 German Heavy Tank Destroyer Elefant (35325).